This article is about the type of property ownership. For other uses, see Timeshare (disambiguation). 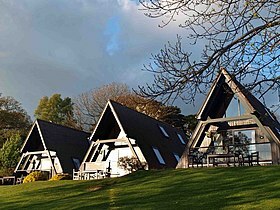 Barnsdale Hall Hotel (UK) timeshare lodges. On the grounds of the Best Western Hotel are a number of timber A-frame chalets. A timeshare (sometimes called vacation ownership) is a property with a divided form of ownership or use rights. These properties are typically resort condominium units, in which multiple parties hold rights to use the property, and each owner of the same accommodation is allotted their period of time. The minimum purchase is a one-week ownership, and the high-season weeks demand higher prices. Units may be sold as a partial ownership, lease, or "right to use", in which case the latter holds no claim to ownership of the property. The ownership of timeshare programs is varied, and has been changing over the decades. The term "timeshare" was coined in the United Kingdom in the early 1960s, expanding on a vacation system that became popular after World War II. Vacation home sharing, also known as holiday home sharing, involved four European families that would purchase a vacation cottage jointly, each having exclusive use of the property for one of the four seasons. They rotated seasons each year, so each family enjoyed the prime seasons equally. This concept was mostly used by related families because joint ownership requires trust and no property manager was involved. However, few families vacation for an entire season at a time; so the vacation home sharing properties were often vacant for long periods. Enterprising minds in England decided to go one step further and divide a resort room into 1/50th ownership, have two weeks each year for repairs and upgrades, and charge a maintenance fee to each owner. It took almost a decade for timeshares in Europe to evolve into a smoothly run, successful, business venture. The first timeshare in the United States was started in 1974 by Caribbean International Corporation (CIC), based in Fort Lauderdale, Florida. It offered what it called a 25-year vacation license rather than ownership. The company owned two other resorts the vacation license holder could alternate their vacation weeks with: one in St. Croix and one in St. Thomas; both in the U.S. Virgin Islands. The Virgin Islands properties began their timeshare sales in 1973. The contract was simple and straightforward: The company, CIC, promised to maintain and provide the specified accommodation type (a studio, one bedroom, or two bedroom unit) for use by the "license owner" for a period of 25 years (from 1974 to 1999, for example) in the specified season and number of weeks agreed upon, with only two extra charges: a $15.00 per diem (per night) rate, frozen at that cost for the life of the contract. The contract had a $25.00 switching fee, should the licensee decide to use their time at one of the other resorts. The contract was based on the fact that the cost of the license, and the small per diem, compared with the projected increase in the cost of hotel rates over 25 years to over $100.00 per night, would save the license owner many vacation dollars over the span of the license agreement. Between 1974 and 1999, in the United States, inflation boosted the current cost of the per diem to $52.00, validating the cost savings assumption. The license owner was allowed to rent, or give their week away as a gift in any particular year. The only stipulation was that the $15.00 per diem must be paid every year whether the unit was occupied or not. This "must be paid yearly fee" would become the roots of what is known today as "maintenance fees", once the Florida Department of Real Estate became involved in regulating timeshares. The timeshare concept in the United States caught the eye of many entrepreneurs due to the enormous profits to be made by selling the same room 52 times to 52 different owners at an average price in 1974–1976 of $3,500.00 per week. Shortly thereafter, the Florida Real Estate Commission stepped in, enacting legislation to regulate Florida timeshares, and make them fee simple ownership transactions. This meant that in addition to the price of the owner's vacation week, a maintenance fee and a homeowners association had to be initiated. This fee simple ownership also spawned timeshare location exchange companies, such as Interval International and RCI, so owners in any given area could exchange their week with owners in other areas. Cancellations, or rescission, of the timeshare contract, remain the industry's biggest problems to date; the difficulty has been the subject of comedy in popular entertainment.. The industry is regulated in all countries where resorts are located. In Europe, it is regulated by European and by national legislation. In 1994, the European Communities adopted "The European Directive 94/47/EC of the European Parliament and Council on the protection of purchasers in respect of certain aspects of contracts relating to the purchase of the right to use immovable properties on a timeshare basis", which was subject to recent review, and resulted in the adoption on the 14th of January 2009 on European Directive 2008/122/EC. Marketing companies are not allowed to offer gifts and solicit for prospective timeshare owners without clearly specifying the real purpose of the offer. The requirements to cancel a timeshare contract must be more practical and less burdensome. NOM recognizes the privacy rights of timeshare consumers. It is strictly prohibited for the timeshare provider to dispose of the consumer's personal information without written consent. Verbal promises must be written and established in the original timeshare contract. The timeshare provider must comply with all obligations written in the timeshare contract, as well as the internal rules of the timeshare resort. The charges that are intended to be made to the consumer must be plainly and clearing defined on the timeshare application forms, including the membership cost, and all extra fees (maintenance fees/exchange club fees). Sell it either through traditional or online advertising, or by using a licensed broker. Timeshare contracts allow transfer through sale, but it is rarely accomplished. Some developers, however, may limit which of these options are available at their respective properties. Owners can elect to stay at their resort during the prescribed period, which varies depending on the nature of their ownership. In many resorts, they can rent out their week or give it as a gift to friends and family. Used as the basis for attracting mass appeal to purchasing a timeshare, is the idea of owners exchanging their week, either independently or through exchange agencies. The two two largest—often mentioned in media—are RCI and Interval International (II), which combined, have over 7,000 resorts. They have resort affiliate programs, and members can only exchange with affiliated resorts. It is most common for a resort to be affiliated with only one of the larger exchange agencies, although resorts with dual affiliations are not uncommon. The timeshare resort one purchases determines which of the exchange companies can be used to make exchanges. RCI and II charge a yearly membership fee, and additional fees for when they find an exchange for a requesting member, and bar members from renting weeks for which they already have exchanged. Due to the promise of exchange, timeshares often sell regardless of the location of their deeded resort. What is not often disclosed is the difference in trading power depending on the location, and season of the ownership. If a resort is in a prime vacation region, it will exchange extremely well depending on the season and week that is assigned to the particular unit trying to make an exchange. However, timeshares in highly desirable locations and high season time slots are the most expensive in the world, subject to demand typical of any heavily trafficked vacation area. An individual who owns a timeshare in the American desert community of Palm Springs, California in the middle of July or August will possess a much reduced ability to exchange time, because fewer come to a resort at a time when the temperatures are in excess of 110 °F (43 °C). A major difference in types of vacation ownership is between deeded and right-to-use contracts. With deeded contracts the use of the resort is usually divided into week-long increments and are sold as real property via fractional ownership. As with any other piece of real estate, the owner may do whatever is desired: use the week, rent it, give it away, leave it to heirs, or sell the week to another prospective buyer. The owner is also liable for an equal portion of the real estate taxes, which usually are collected with condominium maintenance fees. The owner can potentially deduct some property-related expenses, such as real estate taxes from taxable income. Deeded ownership can be as complex as outright property ownership in that the structure of deeds vary according to local property laws. Leasehold deeds are common and offer ownership for a fixed period of time after which the ownership reverts to the freeholder. Occasionally, leasehold deeds are offered in perpetuity, however many deeds do not convey ownership of the land, but merely the apartment or unit (housing) of the accommodation. With right-to-use contracts, a purchaser has the right to use the property in accordance with the contract, but at some point the contract ends and all rights revert to the property owner. Thus, a right-to-use contract grants the right to use the resort for a specific number of years. In many countries there are severe limits on foreign property ownership; thus, this is a common method for developing resorts in countries such as Mexico. Care should be taken with this form of ownership as the right to use often takes the form of a club membership or the right to use the reservation system, where the reservation system is owned by a company not in the control of the owners. The right to use may be lost with the demise of the controlling company, because a right to use purchaser's contract is usually only good with the current owner, and if that owner sells the property, the lease holder could be out of luck depending on the structure of the contract, and/or current laws in foreign venues. The most common unit of sale is a fixed week; the resort will have a calendar enumerating the weeks roughly starting with the first calendar week of the year. An owner may own a deed to use a unit for a single specified week; for example, week 51 typically includes Christmas. An individual who owns Week 26 at a resort can use only that week in each year. Sometimes units are sold as floating weeks, in which a contract specifies the number of weeks held by each owner and from which weeks the owner may select for his stay. An example of this may be a floating summer week, in which the owner may choose any single week during the summer. In such a situation, there is likely to be greater competition during weeks featuring holidays, while lesser competition is likely when schools are still in session. Some floating contracts exclude major holidays so they may be sold as fixed weeks. Some are sold as rotating weeks, commonly referred to as flex weeks. In an attempt to give all owners a chance for the best weeks, the weeks are rotated forward or backward through the calendar, so in year 1 the owner may have use of week 25, then week 26 in year 2, and then week 27 in year 3. This method gives each owner a fair opportunity for prime weeks, but unlike its name, it is not flexible. A variant form of real estate-based timeshare that combines features of deeded timeshare with right-to-use offerings was developed by Disney Vacation Club (DVC) in 1991. Purchasers of DVC timeshare interests, whom DVC calls members receive a deed conveying an undivided real property interest in a timeshare unit. Each DVC member's property interest is accompanied by an annual allotment of vacation points in proportion to the size of the property interest. DVC's vacation points system is marketed as highly flexible and may be used in different increments for vacation stays at DVC resorts in a variety of accommodations from studios to three-bedroom villas. DVC's vacation points can be exchanged for vacations worldwide in non-Disney resorts, or may be banked into or borrowed from future years. DVC's deeded/vacation point structure, which has been used at all of its timeshare resorts, has been adopted by other large timeshare developers including the Hilton Grand Vacations Company, the Marriott Vacation Club, the Hyatt Residence Club and Accor in France. Resort-based points programs are also sold as deeded and as right to use. Points programs annually give the owner a number of points equal to the level of ownership. The owner in a points program can then use these points to make travel arrangements within the resort group. Many points programs are affiliated with large resort groups offering a large selection of options for destination. Many resort point programs provide flexibility from the traditional week stay. Resort point program members, such as WorldMark by Wyndham and Diamond Resorts International, may request from the entire available inventory of the resort group. Timeshare properties tend[weasel words] to be apartment style accommodations ranging in size from studio units (with room for two), to three and four bedroom units. These larger units can usually accommodate large families comfortably. Units normally include fully equipped kitchens with a dining area, dishwasher, televisions, DVD players, etc. It is not uncommon to have washers and dryers in the unit or accessible on the resort property. The kitchen area and amenities will reflect the size of the particular unit in question. Sleep privately usually refers to the number of guests who will not have to walk through another guest's sleeping area to use a restroom. Timeshare resorts tend to be strict on the number of guests permitted per unit. Unit size affects the cost and demand at any given resort. The same does not hold true comparing resorts in different locations. A one-bedroom unit in a desirable location may still be more expensive and in higher demand than a two-bedroom accommodation in a resort with less demand. An example of this may be a one-bedroom at a desirable beach resort compared to a two-bedroom unit at a resort located inland from the same beach. Giftcards or similar pre-paid cards to reimburse a portion of the cost of staying at the resort/location. The vacationing timeshare prospects are presented these incentives in exchange for the promise to the marketing company that they agree to take a timeshare tour before the completion of their stay. If the vacationing prospects refuse to take the tour, they may find the price of their accommodations significantly increased, perhaps be directed to leave the property, and all incentives withdrawn or voided. The prospective buyers (hereby referred to as prospects) are seated in a hospitality room (a term designated by the land sales industry in the 60's) with many tables and chairs to accommodate families. The prospects are assigned a tour guide. This individual is usually a licensed real estate agent, but not in all cases. The actual cost of the timeshare can only be quoted by a licensed real estate agent in the United States, unless the purchase is a right to use as opposed to an actual real estate transaction via ownership. Since timeshares are sold internationally, these laws vary from venue to venue. After a warm-up period and some coffee or snack, there will be a podium speaker welcoming the prospects to the resort, followed by a film designed to dazzle them with exotic places they could visit as timeshare owners. The prospects will then be invited to take a tour of the property. Depending on the resort's available inventory, the tour will include an accommodation that the tour guide or agent feels will best fit the prospect's family's needs. After the tour and subsequent return to the hospitality room for the verbal sales presentation, the prospects are given a brief history of timeshare and how it relates to the vacation industry today. During the presentation they will be handed the resort exchange book from RCI, Interval International, or whatever exchange company is associated with that particular resort property. The prospects will be asked to tell the tour guide the places they would like to visit if they were timeshare owners. The rest of the presentation will be designed around the responses the prospective buyers give to that question. If the guide is licensed, the prospect will be quoted the retail price of the particular unit that best seemed to fit the prospective buyer's needs. If the tour guide is not a licensed agent, a licensed agent will now step in to present the price. If the prospect replies with "no", or "I would like to think about it", the prospect will then be given a new incentive to buy. This incentive will usually be a discounted price that will only be good today (good today only is an untrue statement, and has been used as a sales closing device since day one of the timeshare industry's inception). If again, the reply is "no", or "I would like to think about it", the sales agent will ask the prospect to please talk to one of the managers before the prospect leaves. It is at this moment that the prospect realizes that the tour has actually just begun. A sales manager, assistant manager or project director will now be called to the table. This procedure is called: "T.O. ", or getting the turn over man to find an incentive usually in the form of a smaller less expensive unit or a trade in unit from another owner. This tactic is commonly used as a sales ploy, because the resort is not interested in reselling already deeded property. Similar to the automobile sales industry, the manager and salesman know beforehand exactly what the lowest price is that will be offered to the prospect, well before the prospect has arrived for the tour. If one incentive doesn't move a prospect to purchase, another will follow shortly, until the prospect has either purchased, convinced the usually very polite sales crew that no means no, or has gotten up from the table and exited the building. Timeshare sales are often high-pressure and fast-moving affairs. Some people get caught up in the excitement of the sales presentation and sign a contract, only to realize later that they may have made a mistake. U.S. Federal Trade Commission mandates a "cool off period" that allows people to cancel some types of purchases without penalty within three days. Additionally, almost all U.S. states have laws that specifically govern cancellation of timeshare contracts. In Florida, a new timeshare owner can cancel the purchase within ten days. The law differs by jurisdiction as to whether out-of-state purchasers are subject to the rescission period of their state of residence, or the rescission period of the state where the timeshare purchase was made (e.g., in Florida, the 10-day rescission period applies to all buyers; thus, a Texas buyer who would only have five days in Texas, has the whole 10-day period allotted by Florida Statutes). Another common practice is to have the prospective buyer sign a "cancellation waiver", using it as an excuse to lower the price of the timeshare in exchange for the buyer waiving cancellation rights (or paying a penalty, such as losing 10% of the purchase price, if the sale is cancelled). However, such a waiver is not legally enforceable anywhere in Mexico or the United States. If a recent timeshare buyer wishes to rescind or cancel the timeshare contract, the intent to cancel must be made within the allotted time period in writing or in person; a telephone call will not suffice. In recent years, a timeshare cancellation industry has formed by companies who provide one simple service: timeshare cancellations. However, some of these companies are suspected of being fraudulent. It is more than likely that a new timeshare owner could have purchased the same product from an existing owner on the timeshare resale market for drastically less than what the buyer paid from the resort developer, simply by doing a computer search. In many cases, the exact or similar accommodation purchased, will be happily transferred by an unhappy timeshare owner. The new buyer usually pays only minimum real estate transfer fees and agrees to take over the maintenance fees, because the existing owner can't find a buyer for his/her timeshare without paying a resale company thousands of dollars to absorb it for resale. The reason for this anomaly is that the lion's share of the cost of a new timeshare are sales commissions and marketing overhead, and cannot be retrieved by the timeshare owner. Another reason a new owner might want to cancel is buyer's remorse following the subsidence of excitement produced by a sales presentation. He may have realized that he is uncertain what exactly has been purchased and how it works, or may have realized the unlimited duration of a commitment to pay ownership maintenance fees, or may have observed that he knows too little about the timeshare sales company, due to insufficient time during the sales process. The United States Federal Trade Commission provides consumers with information regarding timeshare pricing and other related information. Also known as Universal Lease Programs (ULPs), timeshares are considered to be securities under the law. Many timeshare owners complain about the annual maintenance fee (which includes property taxes) being too high. Timeshare developers contend that pricing compared to staying at hotels in the long term is projected to be lower to the timeshare owner. However, a hotel guest does not have a monthly vacation mortgage payment, upfront cost, fixed schedule, maintenance fees, and preset vacation locations. Many owners also complain that the increasing cost of timeshares and accompanying maintenance and exchange fees, are rising faster than hotel rates in the same areas. The industry's reputation has been severely injured by the comparison of the timeshare salesman to the used car salesman, because of the sales pressure put on the prospective buyer to "buy today". "The discounted price I quoted you is only good if you buy today", is the industry standard's pitch to close the sale on the first visit to the resort. Many have left a timeshare tour complaining of being exhausted by the barrage of salespeople they had to deal with before they finally exited the tour. The term "TO", or "turn over" man, was coined in the land industry, and quickly evolved to the timeshare industry. Once the original tour guide or salesman gives the prospective buyer the pitch and price, the "TO" is sent in to drop the price and secure the down payment. However, the biggest complaint is that timeshare reselling by the private owner is almost impossible to do. In most cases, an owner looking to sell literally cannot give the timeshare away. Timeshare resale companies have sprung up that actually charge the owner to assume his/her timeshare ownership—contending that the resale company must assume the maintenance fees along with marketing fees—until that burden can be transferred to a new buyer. Timeshares are generally treated as real property and can be resold to another party. However, timeshares do not appreciate in value, and therefore should not be considered a money-making investment. Additionally, as much as 50% or more (modest estimate) of the original purchase price of a timeshare from a developer or resort went towards marketing costs, sales commission, and other fees, which realistically can never be recouped by the owner. Most timeshares resell for a nominal price as low as $1, so the new owner only takes responsibility of maintenance and other recurring fees. Resale price can be considered a market price of the timeshare. There are brokers and agents who specialize in reselling timeshare units on behalf of their owners. This arrangement typically involves listing fees, commissions, or both, being paid by the owner to the broker/agent. In return, the broker/agent markets the resale to prospective buyers. This marketing can take the form of printed materials, Internet postings, radio and television advertisement, and direct telephone solicitations. Most of the fees associated with third party resales are up-front and non-refundable, regardless of whether the unit sells, or for how much. Depending on the terms of the timeshare contract, an owner may rent their week or interval to another party in exchange for payment to the owner. There are third parties that will try to rent timeshares on behalf of their owners as a one-time event or an annual occurrence. The broker/agent will attempt to find a suitable renter in exchange for fees and commissions. In addition to a hands-off experience for the owner, third parties typically handle the money transfer as well. The obstacle of finding a suitable renter remains the same as with any real estate owner, with the usual associated liabilities renting any real property: ensuring payment prior to transferring the use to the renter and coverage for any damage to the unit by the renter. Charities sometimes accept timeshare donations. They must be able to convert the timeshare into cash to benefit from the donation. Charities do not want to become obligated as owners and assume the same annual fees that face the donors. Unless a charity can convert it to cash by resale or rent, the acquisition can become a liability instead of an asset. Some charities charge the donor an acceptance fee, and have no intention of ever making any maintenance fee payments. They take on the obligation and ignore all bills and threats of collection until the original finance company that bought the paper, decides to foreclose on the property. The charity that will legitimately accept the donation, will have the donor continue to hold title while they have an experienced broker try to sell the timeshare and convert it to cash. Wikivoyage has a travel guide for Timeshares. ^ "European Consumer Centres Network". European Commission - European Commission. Archived from the original on 19 May 2015. Retrieved 7 May 2018. ^ "Revision of the Timeshare Directive". Ec.europa.eu. Archived from the original on 2010-03-10. Retrieved 2010-07-27. ^ "AMDETUR - Asociación Mexicana de Desarrolladores Turísticos". www.amdetur.org.mx. Archived from the original on 11 January 2013. Retrieved 7 May 2018. ^ Turismo, Fondo Nacional del Fomento al. "FONATUR-Bienvenido al Fondo Nacional de Fomento al Turismo". www.fonatur.gob.mx. Archived from the original on 24 March 2018. Retrieved 7 May 2018. ^ DGI. "Procuraduría Federal del Consumidor". www.profeco.gob.mx. Archived from the original on 24 October 2017. Retrieved 7 May 2018. ^ "Secretary of Tourism". sectur.gob.mx. Archived from the original on 14 January 2013. Retrieved 7 May 2018. ^ "Timeshare Salespeople - Who is in on the scam?". www.timesharescam.com. Archived from the original on 14 October 2016. Retrieved 7 May 2018. ^ "Taxes on Vacation Homes". Smartmoney.com. Archived from the original on 2010-07-10. Retrieved 2010-07-27. ^ "How to survive a Timeshare Tour". Archived from the original on 2014-02-02. ^ "Overview of the federal Cooling Off Rule in the U.S." Archived from the original on 2014-10-12. ^ http://www.leg.state.fl.us/Statutes/index.cfm?App_mode=Display_Statute&Search_String=&URL=0700-0799/0721/Sections/0721.10.html Archived 2015-10-09 at the Wayback Machine Florida Statutes 721.10. ^ "No cancellation waiver is legal". Archived from the original on 2014-10-17. ^ "Former Employee of Timeshare Consulting Firm Admits Fraud Conspiracy and Unemployment Fraud". FBI. Federal Bureau of Investigation. 11 April 2013. Archived from the original on 16 December 2017. Retrieved 15 December 2017. ^ Brinkman, Paul (14 June 2017). "Westgate accuses Tea Party leader of timeshare cancellation fraud". Orlando Sentinel. Archived from the original on 16 December 2017. Retrieved 15 December 2017. ^ "Valid Reasons for Canceling a Timeshare Contract". Archived from the original on 2014-10-20. ^ "Time and Time Again: Buying and Selling Timeshares and Vacation Plans" (PDF). Archived (PDF) from the original on 2010-05-27. Retrieved 2010-07-27. ^ Sarah Max, "The Timeshare Trap": Frustrated with fees, timeshare owners struggle to donate, sell or give away vacation property" Archived 2008-12-05 at the Wayback Machine, CNNMoney, March 21, 2002. ^ "A Fresh Look at the Math: Buying a Timeshare vs Staying at a Hotel". Hotel-online.com. 17 June 2007. Archived from the original on 24 October 2010. Retrieved 2010-07-27. ^ a b "Time-Share". Lendingtree. 2007-08-06. Archived from the original on 2010-07-19. Retrieved 2010-07-27. ^ "Toughest_8_Sales_Pitches_CBS_News". CBS News. Archived from the original on 2013-03-09. ^ "Why you can't sell your timeshare". Archived from the original on 2017-12-01.